My heart and soul are bursting with joy today. It is truly a special magical day. This post is being published this morning at 7:41 am. The exact moment you entered this world one year ago and I held you safe in my arms and not in my belly for the very first time. There was a time where I didn’t think I’d ever see the day when I’d hold a healthy happy baby after losing your sister, Bella. They call pregnancy after loss having your “rainbow baby”.Â I used to think that was such a silly thing to call it. Pregnancy after losing a child is such a scary, anxiety ridden time.Â It is definitely not a rainbow. You feel at any moment something could go wrong to send the world crashing down around you once again.Â I spent much of my pregnancy with you in denial because I didn’t want my world to come crashing down around me for a second time. Pregnancy is supposed to be a magical time of bonding and connecting with your baby but I spent my 9 months with you in fear that something might go terribly wrong. And I couldn’t stand to live through that pain again. So for me the magic truly came that day I first met you my Brielle, kissed your forehead, and promised you’d be entering a family that loved you waaaaaay before we ever knew you’d be a part of our world. After getting to know you over the past 12 months of your little life I now know what it means to be a rainbow baby.Â You are truly my rainbow after the storm and I feel so lucky to be able to call you my daughter. But, I do have to tell you in all of my wildest dreams I never envisioned a baby as beautiful as you would be mine to have and hold and love forever. When I was younger I used to imagine a vivacious, curly haired dark-eyed version of myself staring up at me and calling me mama. I think you shocked us all when you entered this world with your strawberry blonde hair, crystal clear striking blue eyes, and a cry so quiet that it would put a mouse to shame. If I had to pick one word to sum up YOU in this first year of life it would have to be: SHINING. You were the glimmer of hope that lit my world back up after a year of picking up the pieces of a broken life. I waited long and hard and patiently for your arrival. When you got here you were embraced and appreciated and oh so loved (so so loved) by family and friends near and far. That love just radiates through you and back outward again each and every day. Seriously it can! Just last week the deli clerk at the grocery walked across the store just to say hello to you. She said she saw your smile from across the room and had to come say hello. You spent close to 3 minutes just beaming at her and saying “Hi!”. You can brighten up the day of anyone who happens to cross your path. Especially mine. When I have a bad day all it takes is knowing that I get to come home to you. That can always bring a smile to my face. This weekend your daddy and I celebrated ONE YEAR with you. 365 days. 525,600 minutes. We threw a huge bash. To celebrate surviving. To celebrate overcoming. To celebrate you. You soaked in each and every moment. The house was filled with friends and family from near and far. You shouted with delight, your crawled up to each and every guest, beaming from ear to ear. So happy that so many people were there because they love you.Â The party was beautiful, sweet, & lively just like you. You’re neat and clean just like your dad. You’re a busy bee just like your mom. You love peaches. Books. Naps. Stroller rides. Elmo. Kitties (especially your furry siblings). Yo Gabba Gabba. Remote controls. Nana & Mema & Grandad & Papa. Mama & Daddy. Life. I can’t wait to watch you embrace what’s in store for your life in the coming year. Walking, playing, talking. It’s a big world out there and it’s yours for the taking my love. Sometimes I wonder when I am going to wake up from this dream. How we were blessed with such a perfectly happy, content, and lovable baby I’ll never know. I often think about how the universe works in such mysterious ways. Your sister left us to make way for you in our life. And even though I still mourn a life without Bella, I can’t imagine a life without you in it my Brielle Rose. Happy Birthday my lamb. My little love. My munchkin.Â My 99.Â I love you so very much. 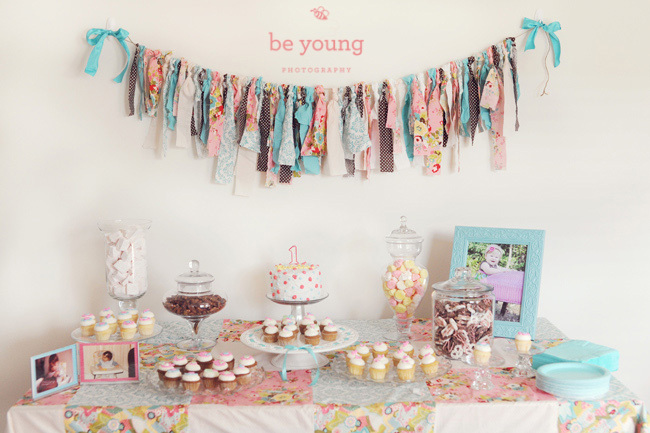 A big thank yous to Belle Papers and Parties, Shugar Shugar Bakery, and Kelly Nelson Photography for creating a party the truly was “Sugar, Spice, and Everything Nice”. Because of you I was actually able to enjoy the celebration with family and friends instead of worrying over the details. The photos above are a combination of mine and those of the lovely Kelly Nelson. 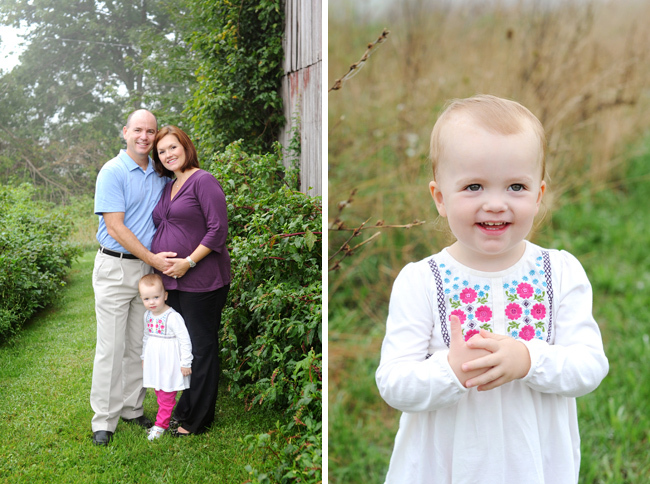 These are just a few highlights of Brielle’s special day. I’m going to let Kelly share the rest of the day with you later this week. LOVE these!!! You did such a great job, so cute!!! 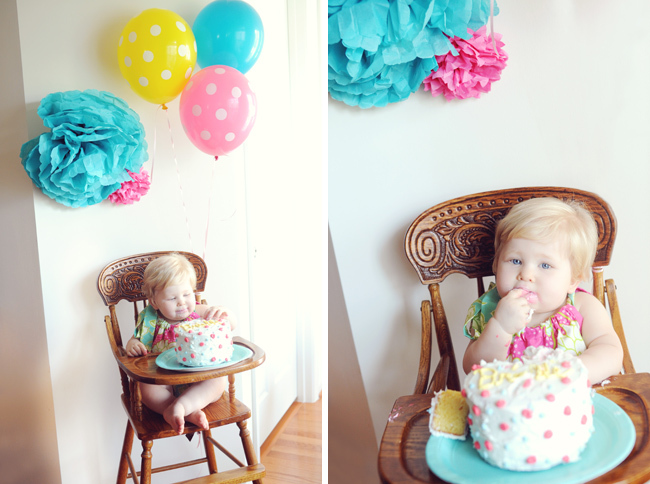 Love all the decorations and the high chair is so neat!! Happy birthday to a pretty little girl! Beautiful party! The decorations are perfect. I especially love the hanging banner with the pieces of fabric. Gorgeous! And a beautiful letter to your daughter. Beautiful Beryl! 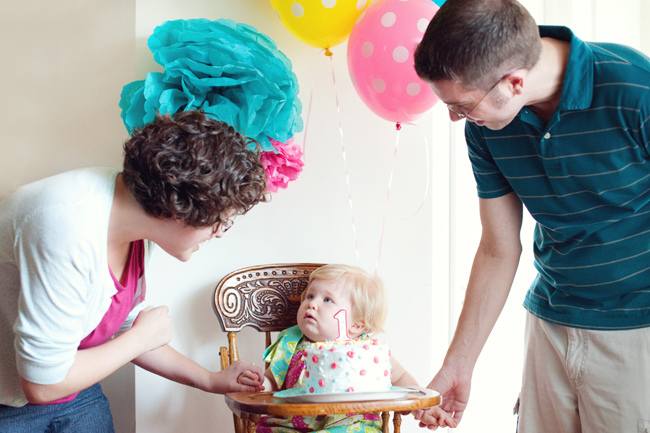 I firmly the parents deserve a party for the first year too! She’s adorable! Beautiful!!! Everything is just perfect! Love all the pictures and it looked like everyone had a wonderful time. HAPPY BIRTHDAY, BRIE! It looks like you had a bash to remember. Beryl and Brendan—congratulations on your first year of parenthood! Here’s to many more that are just as shining! Happy Birthday! Man, that baby girl has a head of hair! Gorgeous! I am sure that Bella was there smiling right along with all of you and in your hearts as you celebrated your sweetie pie! Happy belated birthday, Brielle! Beryl, this is such a sweet letter that I am sure Brielle will treasure some day. It looks like you all had a great time celebrating. The photos are gorgeous! 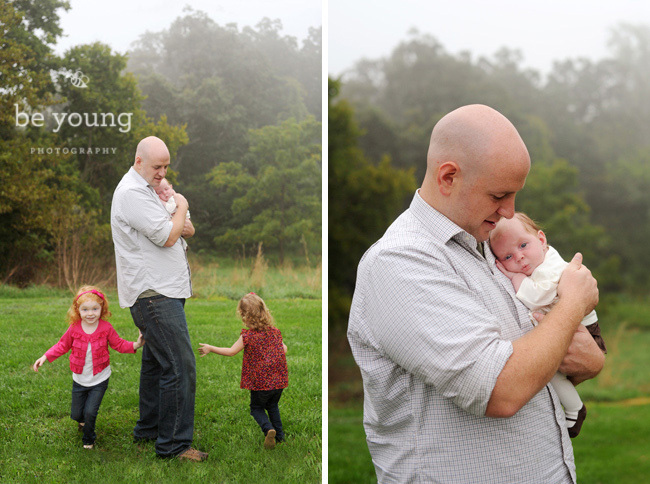 Hello Be Young Photography friends! I hope in the time I’ve been gone the past 18 days you haven’t missed me too much. Since the last time we met the weather is starting to turn cooler, Pumpkin Spice Latte season is upon us (my favorite! ), and OMG my little baby is about to turn the big O-N-E.Â I was also busy shooting this year’s holiday mini sessions and I must say this year was so much fun. I think for today I am just going to let these images speak for themselves. I hope you enjoy them! It’s your birthday month and the days we’re counting down to September 26th are going to fly by so quick, I know it. Soon you will be ONE year old. How can this be possible? It feels like just yesterday I was holding you in my arms for the first time. Is this really the same baby we met only a few short months ago? It’s been awhile since I’ve shared on the space. I’ve missed you, but sometimes we just need some time to breathe. It was that time here. But, now it’s a new month and September 1st feels like the right time to begin blogging again and share where I’ve been. 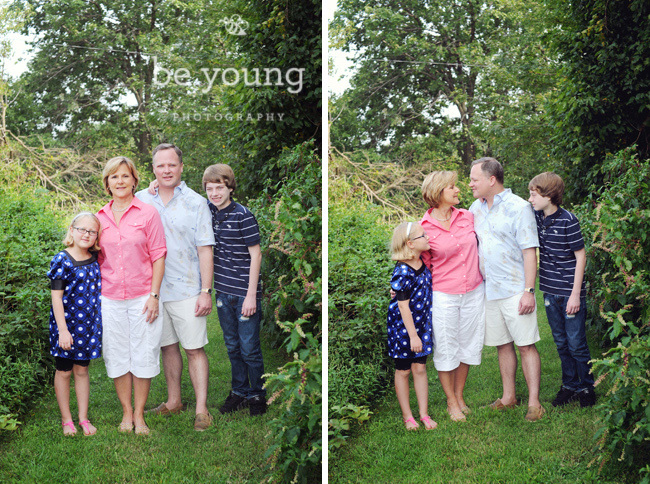 You see, September brings a wide range of emotions in the world of Beryl and Be Young Photography. On this day, two years ago, we received a devastating blow in our world.Â Today was the day we were delivered the news at our 20 week sonogram that our first baby, Bella, was sick. Really really sick. It makes me sick just thinking about it. 11 days later she was gone. And even though the passage of time has lessened the hurt and the pain, September will just never ever be the same. I love more strongly because of her. I hurt more deeply because of her. I embrace each moment tighter because of her. I found the true meaning of passion because of her. And the only reason Be Young Photography even exists is all because of her. For a long time I tried to pretend like I could run a business focused on photographing families and teaching moms about their camera while also honoring my unborn daughter that died. I wanted to house it all here. Sharing the excitement that comes with capturing photos of a happy family in the same place that I was sharing my heartache, empathy, and hope for those dealing with a loss that is impossible to imagine if you’ve never walked in our shoes. This month I realized that it just isn’t possible. A labor of love all in honor of our Bella and a place for my heart to continue to grieve along with the women who know this journey as I do. A place for them to come find support and learn a new way to heal their heart. I created this website in a weekend. I locked myself in a bedroom for 3 hours, tears spilling on the keyboard, writing Bella’s story from start to end. It’s the honest account of Bella and her legacy. And it’s been taking up so much more of my time than I envisioned. So I’d love it if you’d stop by and try to understand the journey that started this all and brought Be Young Photography to the place it is today. CLICK HERE to go to Illuminate. And if you are so moved, come follow along with this new venture on FACEBOOK. But, the story doesn’t end here. And this space is now dedicated solely to the photos, tips, tricks, and teachings I know were meant to be housed here. Family Friday will return tomorrow. Like I said September brings a range of emotions and one of those is pure and utter joy. Because our Brielle also celebrates her birthday this month. 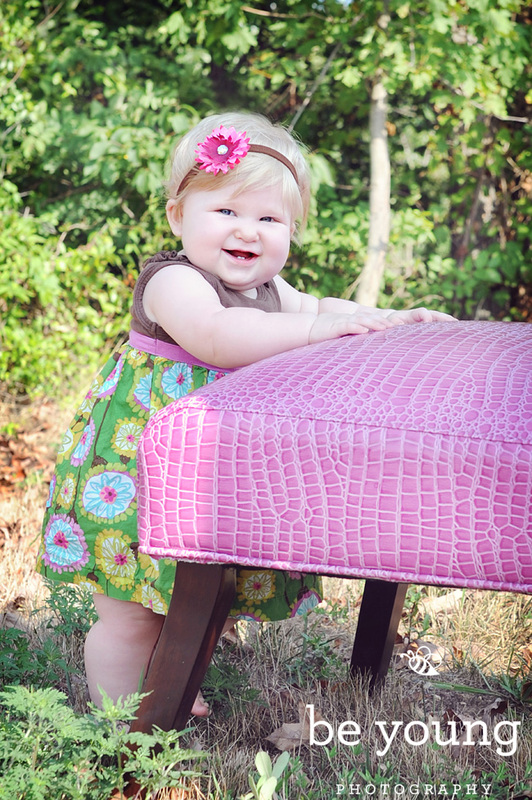 And it’s hard to believe in just a few short weeks she’ll be turning ONE! Time sure is flying by. And it’s time to make the most of the range of emotions September will bring. I just read Bella’s story and I was so moved, and also a bit angry at your doctors. I want to shout at them. Maybe they are worn down by the number of “cases” they see, but they should remember that they are in the business of healing PEOPLE, actual PEOPLE. And words can cut just as deep as wounds. News this difficult should never be delivered so coldly. I’m sorry you had to go through that. You are such a strong person Beryl and I admire your willingness to share and inspire. I’m happy to know you. Thanks SO much for sharing your story and for sharing all of your photography knowledge. I feel so honored to have met you, learned from you, and become friends with you. Looking forward to watching all the I know Illuminate will grow to become! Wonderful job, my friend!! Summer may be winding down, but things are about to really heat up because it’s time to start thinking about the holidays just around the corner. Have you checked everything off your gift list yet? 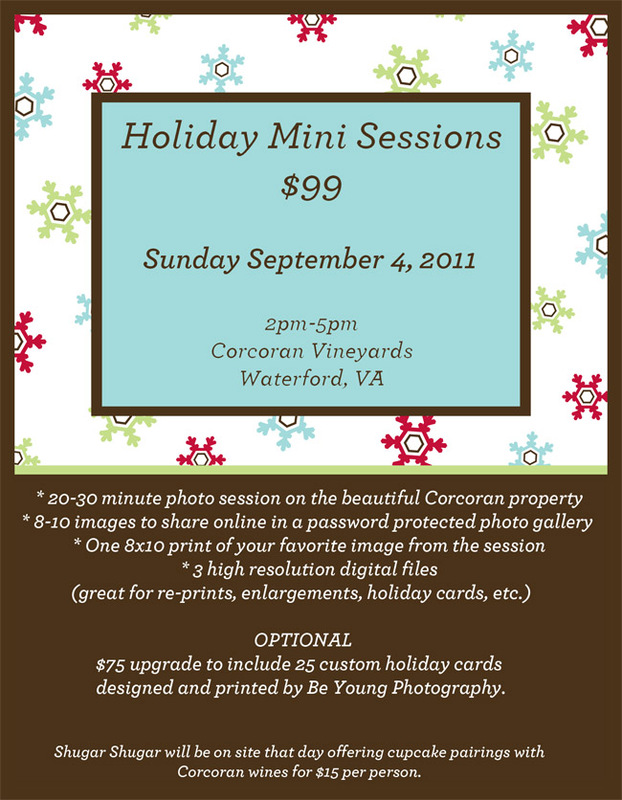 Why not get some of that shopping out of the way early and book a holiday mini session with Be Young Photography. 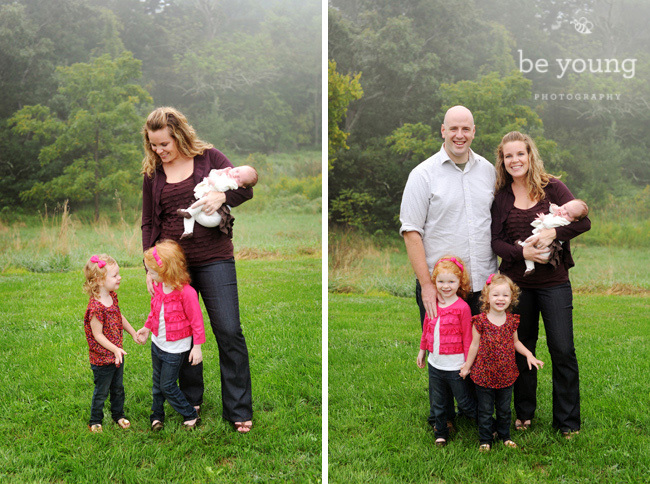 Updated family photos make great gifts and are the perfect addition to your annual holiday cards. And if that isn’t convincing enough, we’ll be doing something just a bit different this year, teaming up with the amazing folks at Corcoran Vineyards in Waterford, VA during their next cupcake/wine pairing day with Ashburn, VA bakery Shugar Shugar. Check the details below and sign up early. 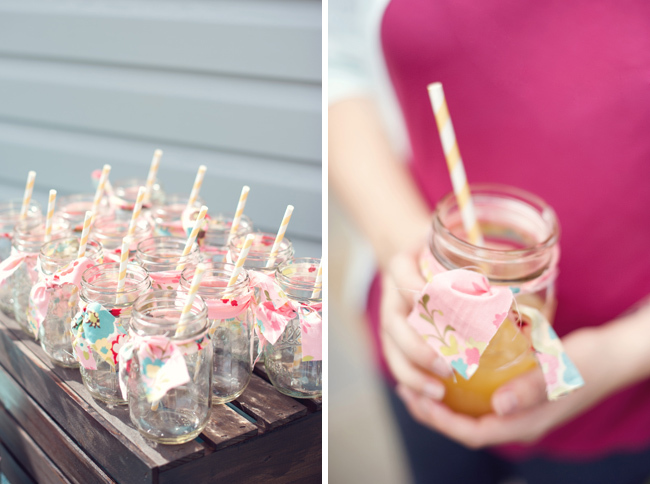 Cupcakes, wine, and photos, these sessions won’t last long!! 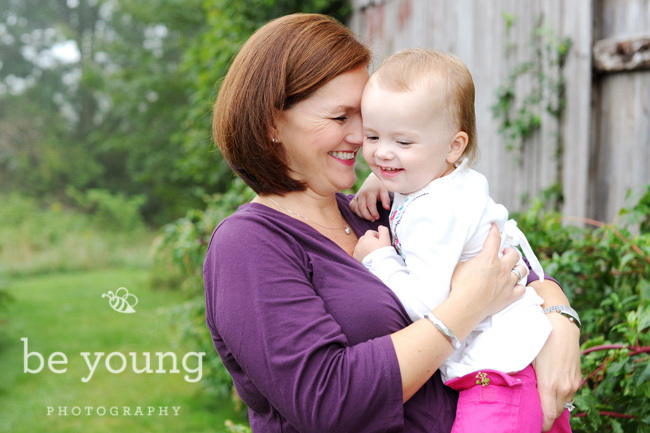 To reserve your spot in the Be Young Photography holiday mini sessions click HERE. 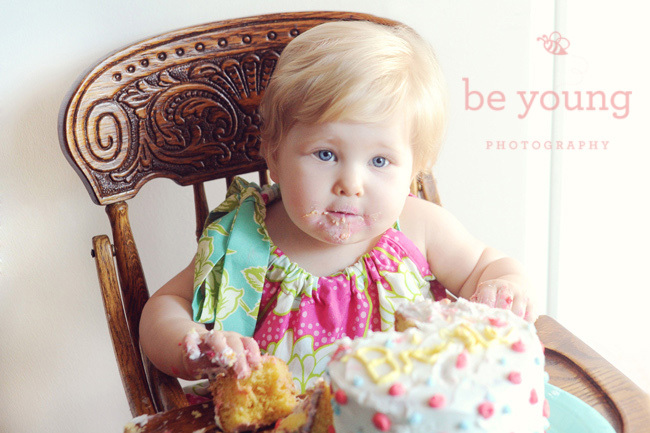 Love your photos and your philosophy! I have a camera that I’m afraid of… might just have to take one of your sessions!